The planetary collision that created the moon may have also violently deposited most of Earth’s essential elements, including the carbon and nitrogen that makes up our bodies, new research suggests. The study by Rice University petrologists, published in the journal Science Advances, suggests that the bulk of life-essential volatile elements were seeded on Earth 4.4 billion years ago in the impact that created the moon. One of the study’s co-authors Rajdeep Dasgupta, the principal investigator on a NASA-funded effort called CLEVER Planets says: “From the study of primitive meteorites, scientists have long known that Earth and other rocky planets in the inner solar system are volatile-depleted. CLEVER planets explores how life-essential elements might come together on distant rocky planets to gain a better understanding of the origin of Earth’s life-essential elements and the implications beyond our solar system. 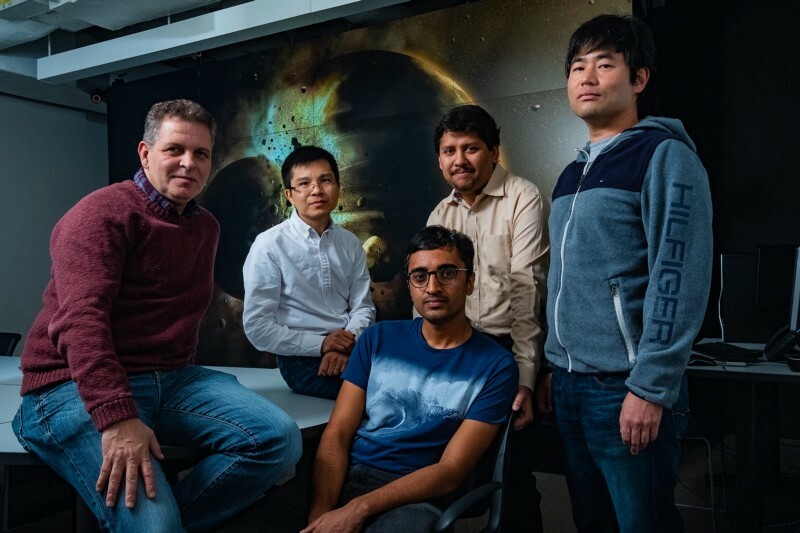 Dasgupta continues: “This study suggests that a rocky, Earth-like planet gets more chances to acquire life-essential elements if it forms and grows from giant impacts with planets that have sampled different building blocks, perhaps from different parts of a protoplanetary disk. The team gathered their evidence by performing high-pressure, high-temperature experiments in a geophysical lab which specialises in studying geothermal reactions deep under the Earth’s surface. The experiments allowed lead-author study lead author Damanveer Grewal to gather evidence to test a long-standing theory that Earth’s volatiles arrived from a collision with an embryonic planet that had a sulfur-rich core. The sulfur content of the donor planet’s core matters because of the puzzling array of experimental evidence about the carbon, nitrogen and sulfur that exist in all parts of the Earth other than the core. One long-standing idea about how Earth received its volatiles was the “late veneer” theory that volatile-rich meteorites, leftover chunks of primordial matter from the outer solar system, arrived after Earth’s core formed. And while the isotopic signatures of Earth’s volatiles match these primordial objects, known as carbonaceous chondrites, the elemental ratio of carbon to nitrogen is off. Earth’s non-core material, which geologists call the bulk silicate Earth, has about 40 parts carbon to each part nitrogen, approximately twice the 20–1 ratio seen in carbonaceous chondrites. The team tested the idea that a sulfur-rich planetary core might exclude carbon or nitrogen, or both, leaving much larger fractions of those elements in the bulk silicate as compared to Earth. The experimenters created models which examined how much carbon and nitrogen made it into the core in three scenarios: no sulfur, 10% sulfur and 25% sulfur. The team then used these results and known ratios of elements on both Earth and non-terrestrial bodies to design a computer simulation which could discover the most likely scenario that produced Earth’s volatiles. Finding the answer involved varying the starting conditions, running approximately 1 billion scenarios and comparing them against the known conditions in the solar system today.